Digital teams up with Canadian legend, Gremlinz. 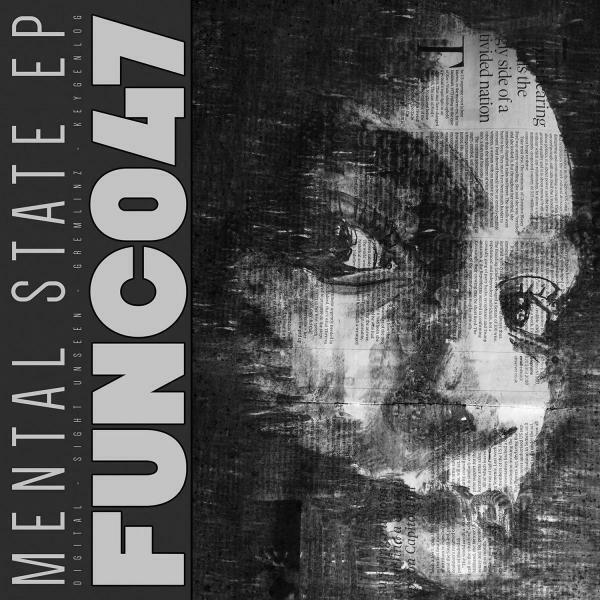 American duo, Sight Unseen and German new boy, Keygenlog for the breaks and bass heavy Mental State EP. Out Of Control features fierce breaks powered by a stabby Phantom Force style riff with an attitude. This is 1994 deep jungle in a 21st century full metal jacket. Bitter Switch is a deeper, colder version of Digital's, 'Bitter Wind' featured on Rupture Recordings. The haunting pads hover above the high pitched clanging Amen in an exciting counterpoint to the dubbed out bass. Too Late Again is full on unforgiving dirty Jungle written with one of the scene's favourite breaks: Blowfly - 'Sesame Street' that features on Deep Blue's, 'The Helicopter Tune' Low Battery. The first collaboration between Digital and the relentless Gremlinz was always going to be an Amen smasher. Nuff said! Artwork by street artist Asboluv aka Boo Dendy "The art of looking sideways"